Theresa Renn with the Kentucky Diabetes Prevention and Control Program sent this note of thanks to Janey Wendschlag for presenting at a recent meeting. Have a thank you note you’d like to send in to be posted on Healthy Times to recognize a co-worker? Send your note to Greg Hiles so that it can be placed in an upcoming feature here. Glendy Ordonez was the winner of the $20 Kroger gift card that was offered through a random drawing for reaching a 78 percent participation rate on the Workplace Climate Committee’s recent Employee Satisfaction and Engagement Survey. About a dozen LFCHD employees competed for the annual Chili Master Trophy, but only one walked away the winner. Click the red “Read More…” link to find out who was named the winner and to see more photos from the event. Starting Friday, Nov. 1, the LFCHD Human Resources team will have a scheduled presence at the Newtown Circle and Regency Road locations. This will give employees at those sites easier access to HR services. An HR representative will be at Regency Road the 11 a.m.-1 p.m. the first Friday of the month starting Nov. 1. The rep will be in an empty nutritionist office on the WIC section of the building. An HR representative will be in Conference Room 3 at 805A Newtown Circle 11 a.m.-1 p.m. the first and third Wednesday of the month starting Nov. 6. If you have any questions about the HR schedule, please contact Blanca Marsh at ext. 2243. From running shoes to library books to massages, LFCHD workers got a chance to sample some products and services during the 2013 Employee Wellness Fair held Tuesday at 650 Newtown Pike. 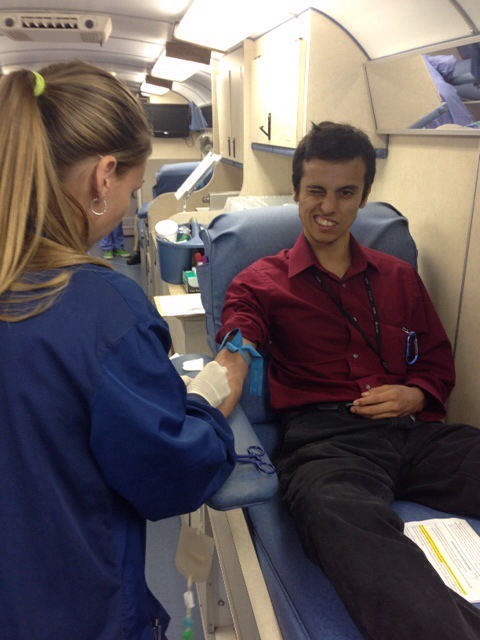 Saymond Ardila was one of 10 LFCHD donors to help the Kentucky Blood Center. The Kentucky Blood Center visited the Lexington-Fayette County Health Department Wednesday afternoon with positive results. A total of 13 registered donors resulted in 10 donations, which will save the lives of 30 Kentucky patients. There were also three first-time donors included. All donors received a $10 gift card. Thanks to all who took part! 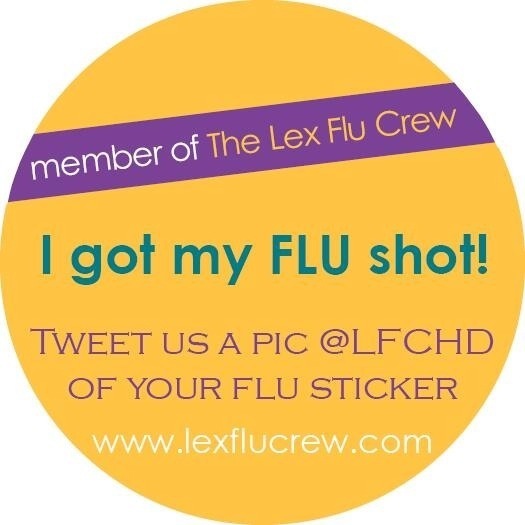 Almost 2,000 people will be fighting the flu this fall and winter thanks to free shots from the Lexington-Fayette County Health Department. LFCHD employees gave 1,921 free flu shots Oct. 11 as part of its annual Free Flu Friday event, which provides the community with vaccinations while allowing the department to test its emergency preparedness. This year’s Free Flu Friday was held at Imani Family Life Center. Two new CEU offerings are now available for all employees, including a Pediatric Abusive Head Trauma presentation on Oct. 18 and a HIV Update on Oct. 25. Remember, all employees are eligible to attend regardless of the ability to earn CEU credits. By attending, you are eligible to earn up 25 wellness points if you are enrolled in the Worksite Wellness Incentive Plan. Click thru to learn more details, and to sign up for the sessions. The Workplace Climate Committee (WPCC) wants to send a big THANK YOU to those staff on the Public Health team who participated in the Employee Satisfaction and Engagement Survey! Overall, 78% of the team participated and completed the survey (approximately 125 employees). Because staff helped achieve this participation rate, the WPCC is happy to raffle at random a $20 Kroger gift card. The winner of $20 gift card is Glendy Ordonez. On behalf of the WPCC, Michelle Donaghy will soon be visiting staff in their department meetings to deliver the complete survey results. Members from the Workplace Climate Committee will follow-up with staff by conducting focus groups with individual departments to discuss their low-scoring items, with the goal to develop action plans for addressing those items.